Mike Trout and Anthony Davis have had similiar careers but what if the NBA followed the same contract system as MLB? Sports Illustrated compares the two superstars after Trout's record breaking 12-year contract worth more than $430 million. Although they play different sports, Anthony Davis and Mike Trout have had similar careers. They have each played seven full seasons for the team that drafted them. They have both been hailed as generational talents, but have mostly been stuck on lousy teams. Davis’s New Orleans Pelicans have won one NBA playoff series. Trout’s Los Angeles Angels have only played in one baseball playoff series. But now Trout is on the verge of signing a massive contract extension that should keep him with the Angels for almost his entire career. 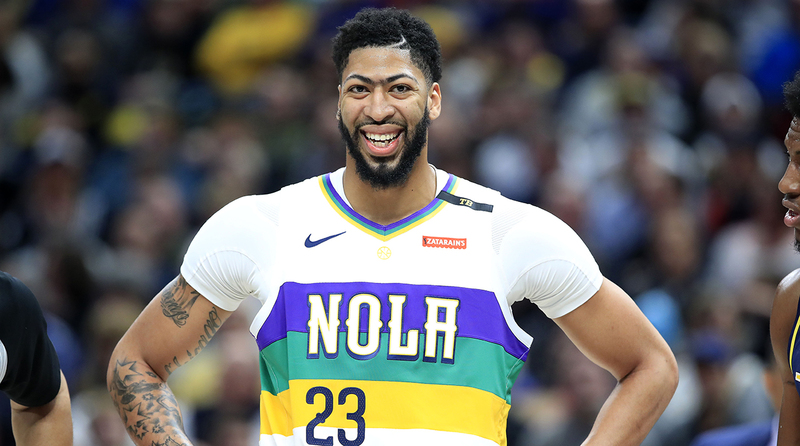 Davis has requested a trade from the Pelicans, and this summer, they will surely oblige. Personalities played a role in their decisions. Trout is more drawn to familiarity than fame. But a bigger factor is the two words that define the modern NBA: max contract. The NBA and the Players Association agreed to a new collective bargaining agreement in the summer of 2017. It does not expire for five more years. But imagine, for a moment, that the NBA had a similar system to Major League Baseball. The Pelicans could have offered Davis whatever he wanted, whenever they wanted, with only the luxury tax to fear. His salary would reflect his actual worth to a franchise, not just a collectively bargained artificial limit. That number would surely top the $37.5 million that Steph Curry is making this year. It might be twice that. Of course, anybody else could also offer Davis whatever they wanted. But staying in New Orleans would still be more appealing than it is right now. Follow along. The main reason Davis wants out is the same reason that most players want out. He wants to win a championship, and winning a championship these days means playing on a superteam with at least one and preferably two other superstars. But the only reason superteams exist is because of max contracts. If NBA stars could get paid what they are actually worth, no team could fit four of them on the payroll, as the Golden State Warriors currently do. It would be hard enough to keep two. When LeBron James and Chris Bosh joined Dwyane Wade in Miami, they actually took slightly less than the maximum salary so the Heat could fill out the roster with good players. But taking slightly less is one thing; taking a lot less is quite another. If the Cavaliers could have offered James whatever they wanted, then James would have had three options: take way less to join the Heat, re-sign with the Cavs, or sign a massive contract to be the sole star somewhere else. For two decades, the NBA has claimed to want competitive balance while instituting a series of changes that work against competitive balance. Maximum salaries encourage stars to cluster; if you can’t make much more on your own, why not band together. The NBA tried to give teams an advantage in keeping their own players by allowing them to offer longer terms and higher annual raises than the rest of the league. But in many cases, that just encourages players to bail on their teams earlier—to request trades so they can go to a new team and then sign for longer terms and higher annual raises. This is what Davis is trying to do right now. I would never argue for a pure free-market system in the NBA, with every team spending whatever they want on payroll. That would be brutal for smaller market teams and would produce the horrifying possibility of Jim Dolan winning something. Dolan’s Knicks would be in position to outspend almost anybody. There are two ways to give small-market teams a chance. One is the draft. Duke star Zion Williamson will be forced to go to whoever wins the lottery (unless he sits out a year). He doesn’t get to choose a team. The other way to give them a chance is some combination of salary cap and luxury tax, which the NBA obviously has. That keeps large-market team payrolls in the same universe as small-market payrolls. But once you have instituted those two factors, you don’t need maximum salaries for individual players—and are actually better off without them. It would weaken the best teams, shortening every other team’s path to contention. I don’t feel bad for the Pelicans. They had seven years to build a contender around Davis and failed. But we have seen similar scenarios play out so often that the NBA should realize why it keeps happening. It is pretty clear. But that begs another question: what does the NBA really want? The league has gotten an undeniable boost from all the player movement. The NBA trade deadline and NBA free agency are bigger events than trade deadlines and free agency in the other sports. Speculation about which star will be the next to switch teams has fueled interest in pro basketball. If you are an NBA junkie, maybe you like things just the way they are—and you want the best teams to be as good as they can possibly be. It’s entertaining. But if you are the fan of one NBA team—or if you own a team—don’t you want that team to have the best chance to win? Look around. Mike Trout is staying put for the same reasons that Colorado Rockies star Nolan Arenado is staying put: he got the money he wanted, to stay in a place he likes, for a team that can build a champion around him. Anthony Davis most certainly cannot relate.